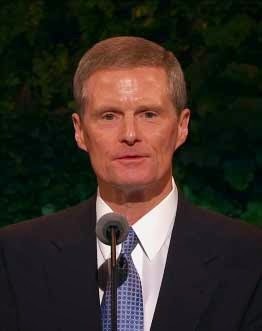 Elder David A. Bednar (1952- ) was sustained as a member of the Quorum of Twelve Apostles in 2004. "The most meaningful and spiritual prayers I have experienced contained many expressions of thanks and few, if any, requests. 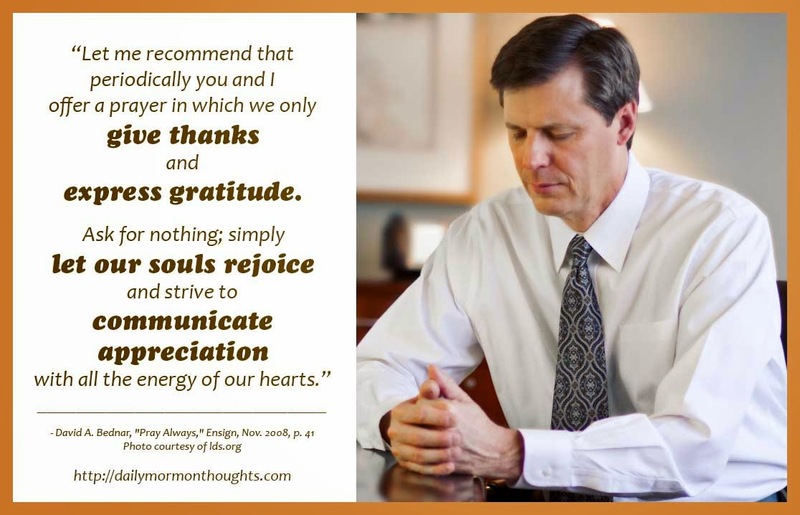 As I am blessed now to pray with apostles and prophets, I find among these modern-day leaders of the Savior's Church the same characteristic that describes Captain Moroni in the Book of Mormon: these are men whose hearts swell with thanksgiving to God for the many privileges and blessings which He bestows upon His people (see Alma 48:12). Also, they do not multiply many words, for it is given unto them what they should pray, and they are filled with desire (see 3 Nephi 19:24). The prayers of prophets are childlike in their simplicity and powerful because of their sincerity. "As we strive to make our prayers more meaningful, we should remember that 'in nothing doth man offend God, or against none is his wrath kindled, save those who confess not his hand in all things, and obey not his commandments' (D&C 59:21). Let me recommend that periodically you and I offer a prayer in which we only give thanks and express gratitude. Ask for nothing; simply let our souls rejoice and strive to communicate appreciation with all the energy of our hearts." Elder Bednar refers to the beautiful description of Captain Moroni as "a man whose heart did swell with thanksgiving to his God, for the many privileges and blessings which he bestowed upon his people" (Alma 48:12). Moroni had more than his share of difficulties and frustrations in his life; but he was humble enough and wise enough to see beyond that and acknowledge the goodness of God in all things. The expression his "heart did swell with thanksgiving" is beautiful! What a marvelous quality to emulate. And then in describing the prayers of contemporary leaders, Elder Bednar notes that they are "childlike in their simplicity and powerful because of their sincerity." That is equally insightful. It's a wonderful reminder that we truly do have much to be thankful for, regardless of the situation or challenges of our life.